Recently, we found lots of Windows 10 users complaining about a strange error. The strange error message “The request could not be performed because of an I/O device error” occurs while performing different tasks related to the hard drives, SD cards, SSD, USB Drives. What makes the error worst is that it doesn’t allow users to read or write from a disk. That means you can’t copy and paste or move things around. So, in this article, we have decided to share you few best fixes to solve The request could not be performed because of an I/O device error. Well, I/O device error means Input/Output Device Error. The error occurs when the operating system fails to connect to the hardware device. There might be several reasons behind the error, it might be due to the outdated drivers, lose connection of hardware, incompatibility issues, or hard drive damage. If your hard disk is damaged, then these methods won’t work and you need to change or repair your hard disk drive. However, if the error is occurring because of other reasons, then it can be fixed in no-time. So, here we are going to share a few best methods to fix the “The request could not be performed because of an I/O device error” from Windows 10 computer. As we all know, a simple restart can sometimes fix lots of software problems. So, if “the request could not be performed because of an I/O device” error is occurring because of software that you have installed then it can be fixed with a simple restart. So, its always better to restart your computer before making further changes. Therefore, make sure to restart your computer and then check whether the error persists. Well, the “The request could not be performed because of an I/O device error” also occurs due to a loose connection between the hardware and computer. So, the next that you need to do is to check whether the hardware is properly connected or not. For example, if you are getting the error while transferring files to the USB Drive, then remove the USB drive and reinsert it. If the error was occurring because of loose connection, then it will be fixed straight away. Similarly, you need to check whether the hard drive is properly installed on your computer or not. SFC command scans and fixes system related files of your Windows computer. Not just that, but the SFC command is extremely helpful when it comes to fixing the corrupted windows file. So, we need to run the SFC command on CMD to fix the “The request could not be performed because of an I/O device error”. Here’s what you need to do. Wait until the scanning process completes. CHKDSK is another useful command which you can use to fix The request could not be performed because of an I/O device error. CHKDSK verifies the file system integrity of a volume and fixes logical file system errors. Here’s how you can use chkdsk command to fix the I/O device error. The ChkDsk command will identify any bad sector and will attempt the recovery options. Well, the Windows operating system provides us with lots of troubleshooting tips. One of those is to check hardware for the errors. 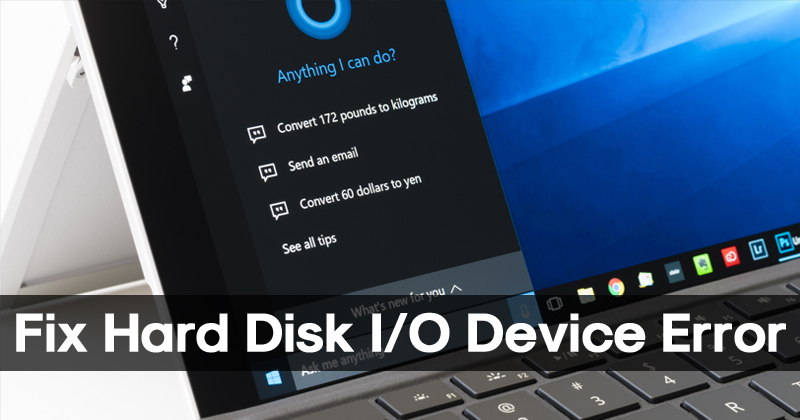 In fact, running the Windows default tool to fix the I/O device error is one of the effective methods that you can try today. So, here’s how you can use the Windows default tool for Error checking. Right click on the drive where you are getting the error and select Properties. That’s it, you are done! After completing the error checking process, the “The request could not be performed because of an I/O device error” will be fixed.